The CWI is the national scientific research center on mathematics and computer science of the Netherlands Organization for Scientific Research (NWO). Its mission is the discovery of knowledge and the transfer to society and industry including energy topics. Multiple groups are working within the energy theme on computational fluid dynamics, plasma physics, smart power grids, and biofuels. The goal of the workshop is to discuss the long-­term European scientific challenges in offshore wind energy and to translate them to the strengths of the Dutch research environment. Witteveen, J.A.S. (2014). 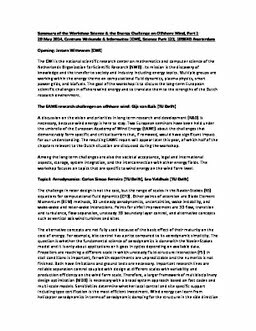 Summary of the Workshop Science & the Energy Challenge on Offshore Wind, Part 1. Scientific Computing [SC]. CWI.